November 15, 2017—-Planet Earth was formed about 4.5 billion years ago. Geologists have divided this long history of the planet into several pieces called eras. They are the Precambrian, Paleozoic, Mesozoic, and Cenozoic. The Precambrian is the longest and each of the other three are shorter than the previous one. When considering climate change through geologic time, two aspects stand out. The first is that for most of geologic time Earth has been warmer than it is at present. How much warmer varied through time. The second feature that stands out is the intermittent ice ages when large portions of the earth were covered with ice. Following the ice age at the end of the Precambrian, the earth rapidly warmed. 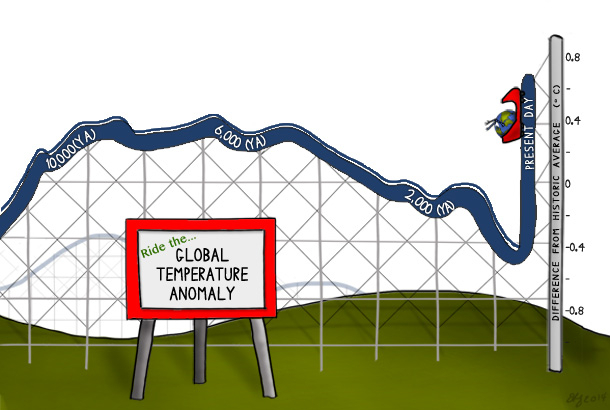 For the remainder of the history of the earth, temperatures have averaged 5 degrees C (9°F) higher than at the present. These warmer conditions existed probably 90 percent of the time over the past 570 million years. An ice age, called the Permo-carboniferous, began at the end of the Paleozoic Era. It began about 325 million years ago and lasted until about 250 million years ago. The South Pole was in the midst of the large land mass called Gondwanaland. Ice sheets moved over about half of this large land mass. What is now Antarctica and parts of Australia, India, Africa, and South America were covered with ice. The glaciation of each of these areas did not take place at precisely the same time, but they were all affected by the same climatic cooling. The Southern Hemisphere suffered widespread glaciation, but the Northern Hemisphere remained warm. The most appealing explanation for this situation is a different relative location of the land masses. The northern continents were nearer the equator and the southern land masses nearer the poles. After the glaciation in the Permo-Carboniferous ice age, the earth again entered a long period of warm conditions. The period of warmth continued through most of the Mesozoic Era and the earth was free of glaciation. Temperatures were warm and rainfall was abundant on the land masses. Even the polar regions experienced mild weather. Initially, the warmer conditions resulted from the slow migrations of the large southern hemisphere land mass to the north. This carried areas that had been glaciated into warmer climates. The most important single environmental event since the human species has been on earth has been the oscillation between glaciation and interglacials during the Pleistocene Epoch. The epoch represents a large change from much of the last 570 million years. This ice age is the most recent of the major cold periods to occur over the history of the planet. During the time when the ice was most extensive over Earth, temperatures averaged about 4°C (7°F ) lower than those of the present. In the northern hemisphere it was perhaps 8 to 12 °C ( 14 to 22°F) lower than current temperatures. There is no question but what the climate of planet earth has changed frequently, and sometimes drastically, over geologic time. Climate change at the present is of great consequence to most species including humans. There is really no way of knowing how much change will take place in the foreseeable future nor how much is due to the activity of our species. What is known is the earth is warming rapidly at this time and that all evidence points to human activity as bearing the responsibility. Now is the time to take international action and not only support the Paris Agreement, but take even more drastic measures to curtain the warming! Categories: Climate Change, Extreme weather, Fossil Fuels, Renewable Resources, Solar | Tags: #climatechange, #renewableenergy, Renewable energy | Permalink. So this makes me wonder: is ‘human activity’ responsible for the current increase? Can any change to ‘human activity’ reduce the ‘warming’ effect by 2 degrees, 1.5 degrees, or at all? Paul, Thanks for taking the time to comment on this blog. I have been away and so did not see it until yesterday. I want to focus my reply on the the last several paragraphs. I agree completely with your statement that it is our responsibility to act and act now. While in many ways things are getting worse there is room for hope. I do not even believe that climate change is the greatest problem the world faces. It is certainly a factor but population growth and global poverty are worse.